The Frost-Coolidge Music Festival. 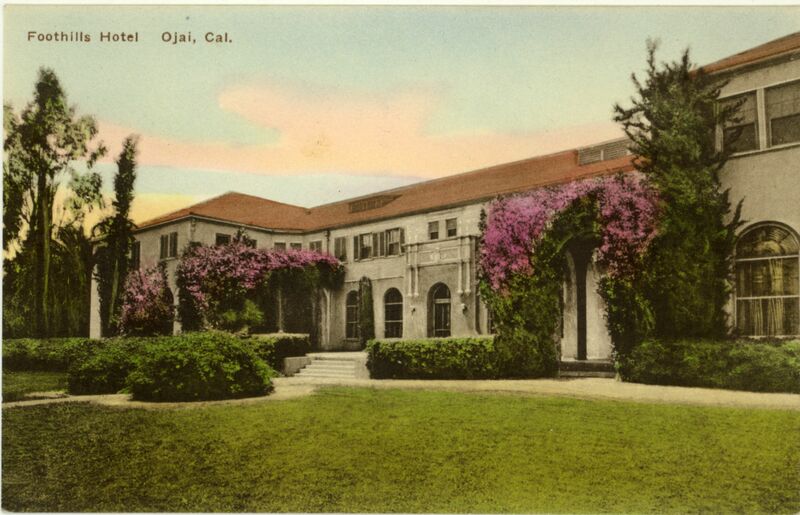 Although the Foothills Hotel catered to wealthy Easterners, Ojai residents often benefitted from the cultural and social events held there. A good example was the Frost-Coolidge Music Festival of 1926. Elizabeth Sprague Coolidge, who had a winter home in Ojai, was one of America’s foremost promoters of chamber music. She teamed up in 1926 with another Ojai resident, Frank Frost, to create a three-day chamber music festival at the Foothills Hotel. Two-thirds of the audience was Ojai residents. When the festival concluded, The Ojai proclaimed, “One of the greatest musical events that has ever taken place in America came to a close on Sunday evening with the final concert of the Ojai Musical Festival.” Many consider the Frost-Coolidge Music Festival to be the forerunner of the current Ojai Music Festival.